The project's latest exhibit, Lives in Transit, showcases unedited footage of the daily lives of transportation workers from around the world, including Vietnam, Nepal, Turkey, China, India, South Korea, Colombia, Spain and Canada. The exhibit premiered at Lincoln Center for the New York Film Festival, and previously showed at the Berkeley Art Museum and Pacific Film Archive, the Phoebe A. Hearst Museum of Anthropology, the CITRIS Tech Museum, and will show later this year at the Smithsonian. Lives in Transit is currently on display at the Harvard Science Center through March 2018. David Evan Harris, Global Lives Project Founder, will speak about the evolution of the project, and its ambitious goal of connecting the diverse experiences of humanity around the globe, and building empathy. Two questions inspire David Evan Harris' work: “What would global empathy look like? And what are the boundaries of your moral universe?” In his recent talk, Harris discussed his goal of encouraging people to “step out of [their] world” and see what daily life is like for others. The Global Lives Project was started in 2002. The project, which curates 24-hour long videos of people’s daily lives throughout the world and hosts them online and in in-person exhibitions, has grown immensely since its inception. The project’s latest installment is called Lives in Transit, and follows ten transit workers across the globe. In order to ensure representation in their participants, Harris and his team developed a multimodal matrix to account for demographic diversity. In 2014, researchers at the Stanford Graduate School of Education developed the Unheard Stories Curriculum, a common core compliant program aimed at middle and high school students, with the goal of cultivating empathy through interaction with the Global Lives exhibit. Overall, after participating in the curriculum, students have shown an increase in measures such as feeling like they can make a difference in the world, and interest in both community and world-wide social issues. Harris has identified several next steps for the project. First, he wants to expand exhibition into more museums, galleries and universities. Second, Harris hopes to support further research intothe educational aspect of the project. In addition to widening distribution of the curriculum to colleges and workplaces, he also plans to conduct qualitative research with students and teachers, add a longitudinal component, and increase the sample size of already-completed quantitative measurements. 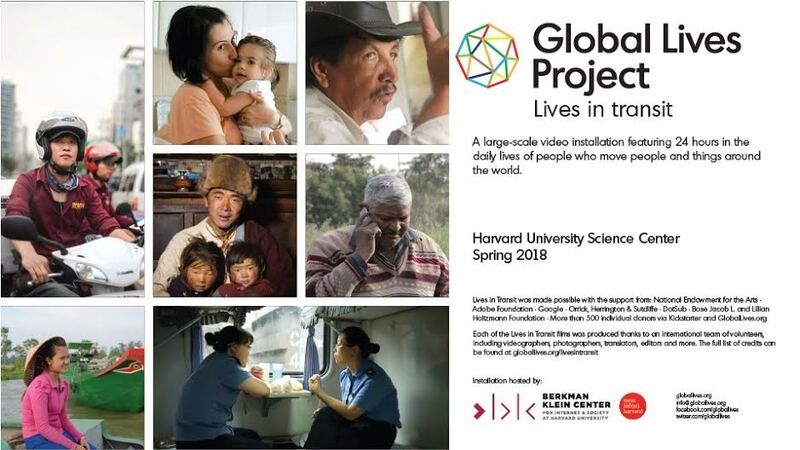 The Global Lives Project: Lives in Transit is a large-scale video installation featuring 24 hours in the daily lives of individuals who move people and things around the world. UC Berkley News, "Global film project elevates the ordinary"